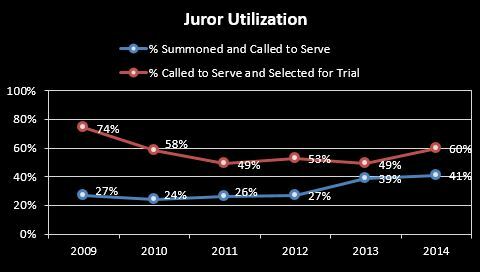 Definition: Juror utilization is the rate at which prospective jurors are used at least once in a trial or voir dire. Purpose: Effective Use of Jurors provides information on jury management practices so as to minimize the number of unused jurors who are selected for a trial. More specifically this measure addresses the problem of non-use of jurors due to settlements and pleas and the problem of calling in more jurors than are needed for the selections of a jury(s).